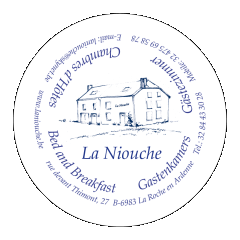 La Niouche is located on a high plateau at barely 5 km from the tourist town of La Roche-en-Ardenne. The B&B rooms - where hospitality and friendliness are top priority – are housed on the second floor in a typical ancient Ardennes farmhouse. The green surroundings and unspoiled nature invite for hiking, cycling, mountain biking, kayaking or simply enjoy the garden all year round. Easily and quickly accessible in barely one hour drive from the busy cities to a heavenly peace.